De Broglie's 1922 doctoral thesis introduced his theory of electron waves, including the wave-particle theory based on the work of Einstein and Planck. In 1924 he speculated that all matter, not just light, has the properties of both particles and waves (wave-particle duality). His theories, which were later confirmed by the discovery of electron diffraction by crystals in 1927 by Davisson and Germer, were later used by Erwin Schrodinger as the basis for the development of wave mechanics, a new field in physics. Between 1930 and 1950, his work was mainly concerned with the study of various extensions of wave mechanics such as Dirac's theory of the electron, the new theory of light, spin particles and the application of wave mechanics to nuclear physics. He also worked to develop a causal explanation of wave mechanics. In 1952 UNESCO awarded him the first Kalinga Prize for his efforts to explain aspects of modern physics to the general public. In 1956 he received the gold medal of the French National Scientific Research Centre. 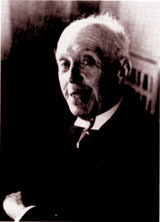 He was elected a member of the Academy of Sciences of the French Institute in 1933, and in 1942 became its Permanent Secretary for the mathematical sciences. De Broglie held the Grand Cross of the Légion d'Honneur and was an Officer of the Order of Leopold of Belgium. He was an honorary doctor of the Universities of Warsaw, Bucharest, Athens, Lausanne, Quebec, and Brussels, and a member of 18 foreign academies in Europe, India, and the USA. Some of the information on this page is based on content at Nobelprize.org © The Nobel Foundation.